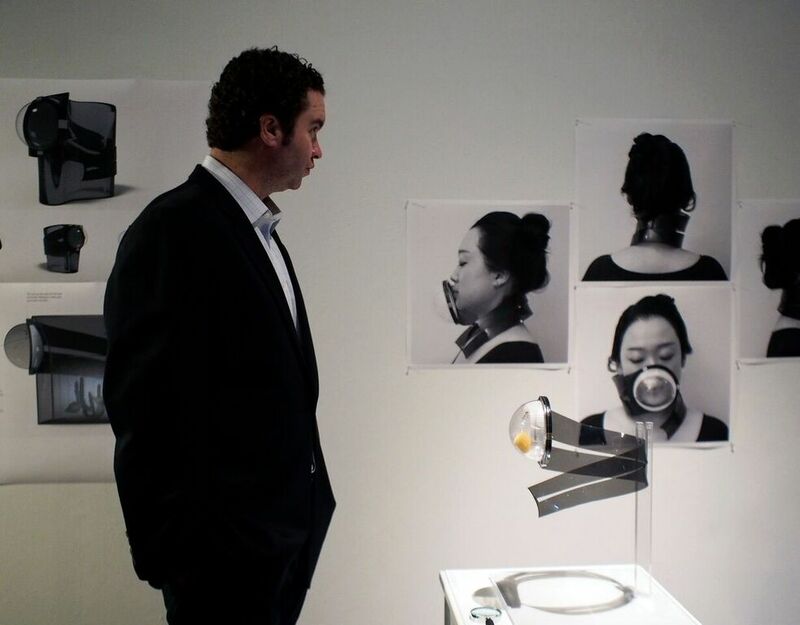 The Biological Design class culminated in an exhibition at Penn’s Morgan Gallery on Thursday, December 17. 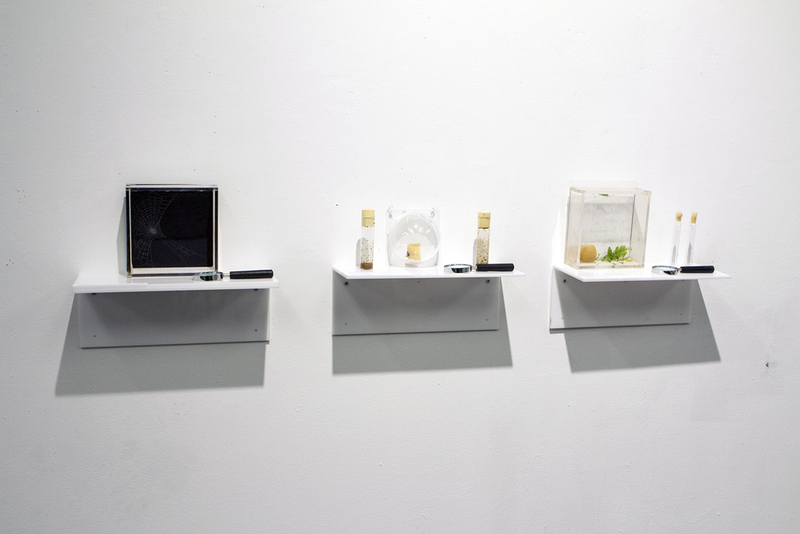 Our show, BYO: Four Inquiries into Biological Design, gave each group the opportunity to showcase their work with installations that featured prototypes, videos, detailed renders, and a live performance. We presented our projects to a small audience of classmates and biological designers during a critique earlier in the day, and then opened our work to the public from 5–7pm. From this exhibition, one of the four projects will be selected to compete in the Biodesign Challenge, where designs from different schools will be showcased in front of members of the academic, industrial, and design communities at the Biodesign Summit in June 2016. A cicada-inspired sound exploration and performance through chitin, the second most abundant polymer on Earth. The Khitophony group's installation design was a manifestation of their sound exploration through chitosan, the industrial form of chitin. 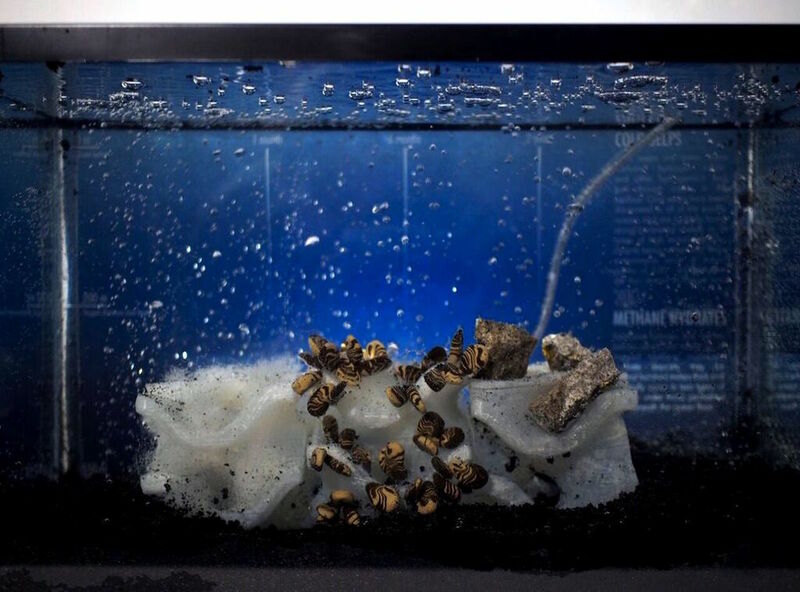 A terrarium outfitted with chitosan tambourines wired to large amplifiers served as the main installation piece. An interesting characteristic of chitosan that differentiates it from regular plastic is that it degrades when exposed to water, so the bioplastic can be reused as a plant fertilizer; the group showed this distinction through the instrument’s design by using the sound of water dropping and dissolving chitosan as music. 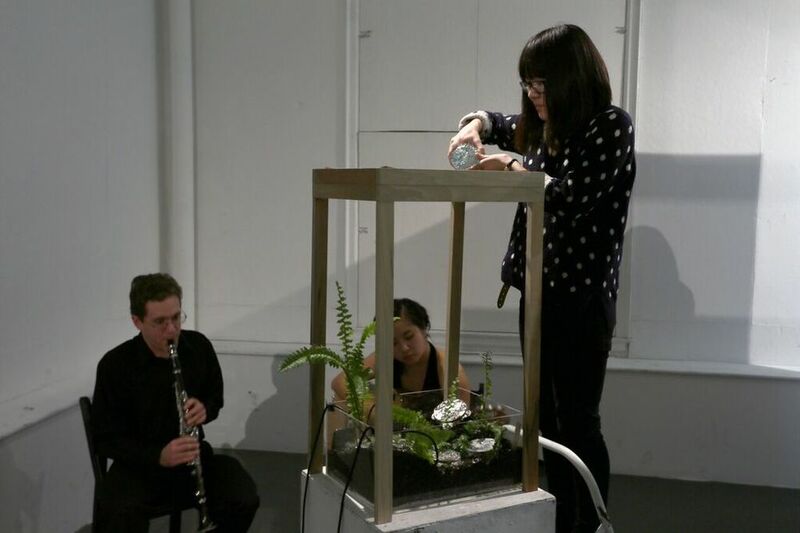 A performance inspired by the routine chore of watering plants was performed twice, accompanied by a musical duo of Lee Dietterich on clarinet and Wing So on guitar. An illustration of the cicada lifecycle added context to the performance. 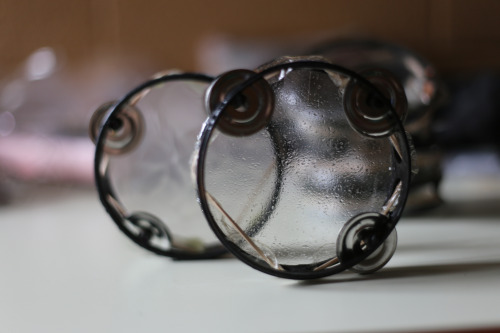 The group described Khitophony as an intellectual challenge because working on the conceptual narrative behind the project was an entirely new approach to design. They enjoyed working within an art and research framework, learning biology with a hands-on approach, and connecting with collaborators towards the project completion. Stabilimentum, inspired by the latin word for support, is an aesthetic wearable that filters air for the user by utilizing the natural electrostatic properties of spider silk, while creating a synthetic symbiotic relationship between human and arachnid. The Stabilimentum installation was centered around the group's physical prototype—a face mask constructed out of black and clear plastic that features a dome over the mouth where a spider lives and spins its web. Around this prototype, the group displayed glossy renders of the mask and large-scale images of users wearing the product. Leading into this main display was a projected video that served as an introduction and explanation of the product, along with three shelves that displayed the group’s live spiders and webs. Each shelf had a miniature magnifying glass so that viewers could closely examine the spiders in their glass boxes and the accompanying tubes of bugs that served as the spider’s food. The group’s intention of using biology in a useful and fashion-forward manner was reflected in their highly designed and orderly installation. SeepScape terraforms the ocean floor with modular structures that take the shape of the gyroid, an infinitely-connected periodic surface. By encouraging the expansion of deep-sea symbiotic communities, SeepScape increases methane sequestration and has future applications in the sustainable farming and synthetic manufacturing industries. The SeepScape team's installation focused on displaying a prototype of the gyroid placed at a deep-sea methane seep. 3-D printed gyroids illustrated the succession that the product would undergo, from bacterial mats to Bathymodiolus mussels to calcium carbonate deposits. The tank display was supplemented with a backdrop graphic that informed the viewer about methane seeps and methane hydrates, including a time scale and depth info. 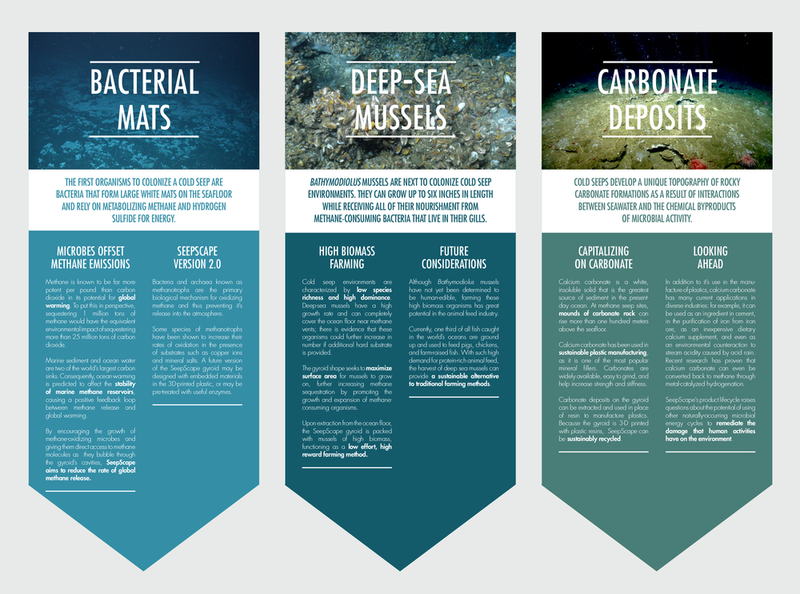 Above the tank, a triptych infographic described the biology of the organisms at the site, as well as the environmental and industrial impacts and future considerations of the project. Next to the main tank display, a rendered video that depicts dropping and retrieving the gyroid from the ocean was shown on an iPad. Finally, the growth of Pseudomonas putida bacteria on the entire surface of a gyroid was shown under black light, proving that the gyroid shape can provide a maximal surface area for bacteria and larger organisms to colonize. The group's use of a black light and a backlit tank made the installation viewable with the gallery's lights turned off, mimicking the darkness of the deep ocean. Probiome introduces a personalized probiotic microbiome to everyday objects. Probiome's goal with their exhibition was to convey their research, prototype, and future applications all in an easy-to-access manner. The group’s detailed research into the human microbiome and the interaction between Staphylococcus epidermidis and Staphylococcus aureus was reflected in their presentation. The group displayed a video about the skin microbiome on an iPad directly behind a petri dish with cultured S. epidermidis. 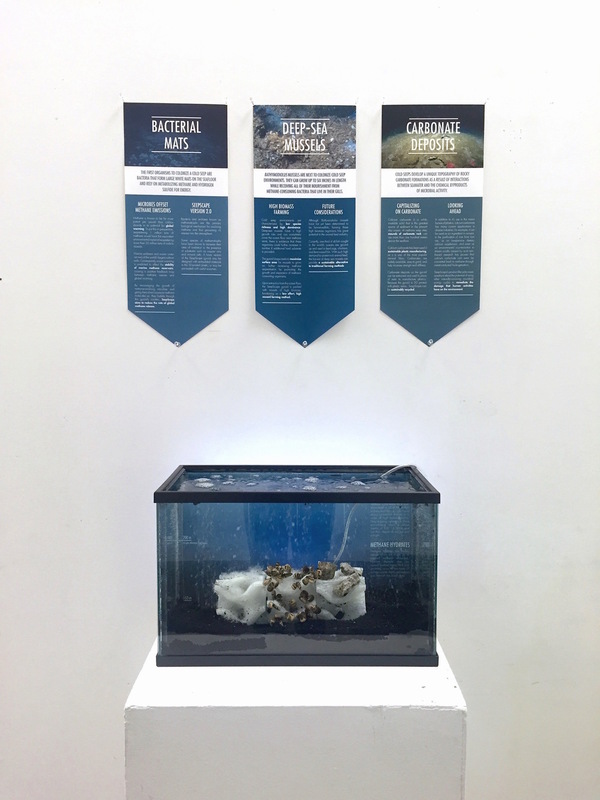 Next to this introductory display was the Probiome prototype—a projected keyboard powered by an Arduino that sprays customized bacteria to promote a healthy microbiome on the user’s hands. 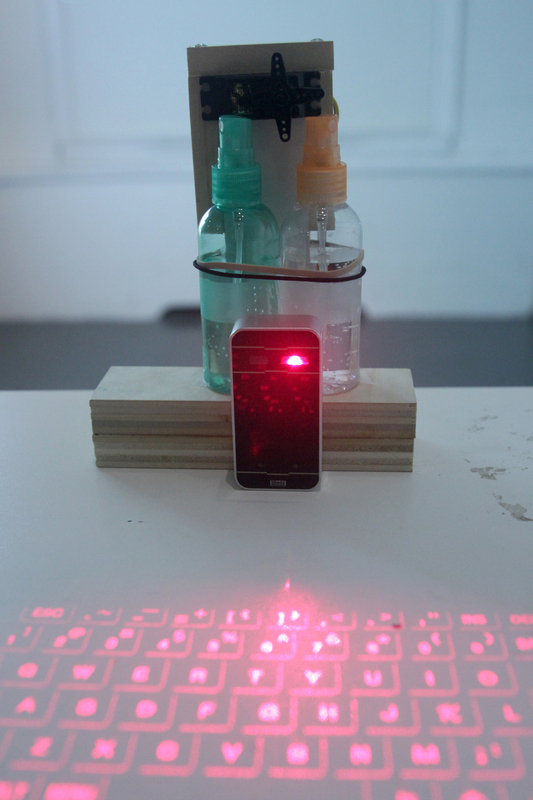 The third part of the installation was a video projected on the back wall that featured a future application of the group’s customized bacterial cartridges: Probiome Wear, a wrist wearable. The Probiome group remarked that working on their project was definitely challenging, but that it was very fulfilling to be able to design and build the prototype of a system that has multiple future applications. Each installation showcased both the successes and the hardships experienced when designing biology. Although our initial inquiries into biological design have come to a close with the end of the semester, the class has developed a unique insight into the cutting-edge and challenging field, and some students are already planning on using the skills they have developed for upcoming projects. After taking the class, Jenny Ho views biological design as a space where people from non-scientific backgrounds, like artists and designers, can deeply engage with and be critical about developments in science. She would like to bring the mindset of critical and speculative design into her future design projects. Wing So is inspired by the cutting-edge nature of biological design and is especially interested in BioArt and Critical Design. In the near future, she plans to look into the various DIY Bio spaces and accessible platforms introduced to us in our final class. Vincent Snagg views biological design as extremely (and productively) interdisciplinary. He believes the field is an increasingly important paradigm that certain designers will need to be aware of as their concerns begin to involve biology and the world’s problems outside of two dimensional design.